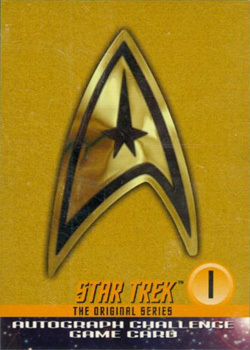 This is the first of three series of cards representing all three seasons of the Original Series released in consecutive years from 1997 to 1999. Each episode was represented by three Base cards, two Character Logs (2:1), two Behind the Scenes (1:2) , one Profiles (1:4), and one Gold Plaque (1:12), which could be conveniently arranged in 9-pocket pages. The common sets and the four chase sets use dual numbering schemes as listed below. 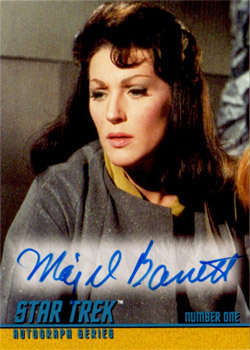 Each set also included a series of Autograph Cards (1:36) of cast and guest stars from that season. 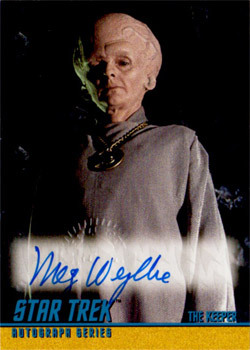 Inserted 1 per pack in each series were Autograph Challenge cards. There was one key card limited to just 50 copies, with each having a unique hand written code on it. Any collector who redeemed a full set of cards, which together spelled the required phrase, would win a complete set of autograph cards for that series as well as a voided verison of the key letter card! 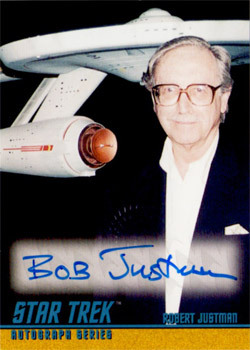 Season One had 12 different letters which could be collected to spell the phrase "STAR TREK AUTOGRAPH SERIES", and the key letter card was "I". Skybox 1997 16,000 36 9 2½" x 3½"
EP10.3 What Are Little Girls Made Of? EP10.4 What are Little Girls Made Of? EP10.5 What are Little Girls Made Of? EP10.6 What Are Little Girls Made Of? EP10.7 What are Little Girls Made Of? EP10.8 What are Little Girls Made Of? EP10.9 What are Little Girls Made Of? in "Dagger of the Mind"
in "The Conscience of the King"